A True Multi-Use Bumper Stand From Start To Finish. Total Efficiency. The Innovative SuperStand bumper repair stand boosts your profits by speeding up repair, prep, and painting times and reducing costly paint mistakes! Save 15 minutes per cover! No more missed edges. 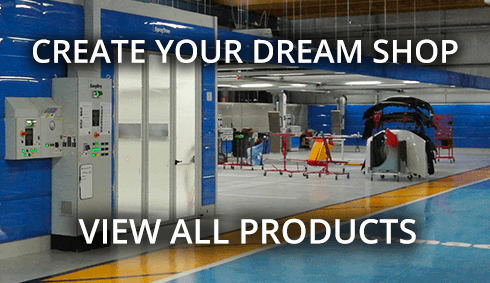 The auto body repair industry’s leading paint stand pays for itself in just 2 months. This heavy-duty bumper stand will hold any plastic bumper cover without touching the painting surface. Your bumpers are securely held in place by support arms containing a swivel clamp that can move into any position. The protective rubber boots on the support arms help keep critical bumper areas free of paint over spray. The boots cover bumper areas that tend to swivel, slide, or have threads. 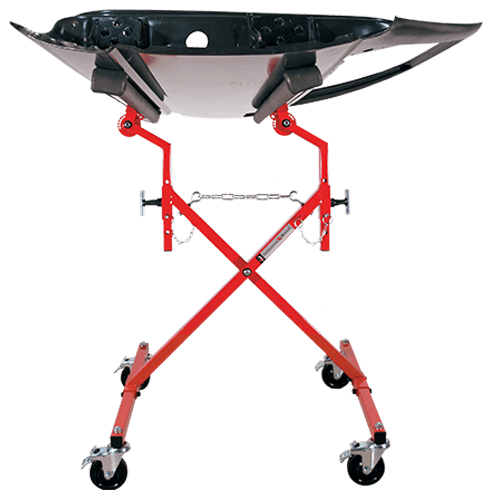 This bumper paint stand also features wheel locks that not only keep the wheels from rolling but prevent the stand stem from swiveling. The five locking positions on the SuperStand bumper stand allow you to paint the bumper stand as it sits on the car and also cover hard-to-reach bumper pockets. With unsurpassed durability and versatility, the SuperStand bumper stand is an excellent addition to any auto body shop.